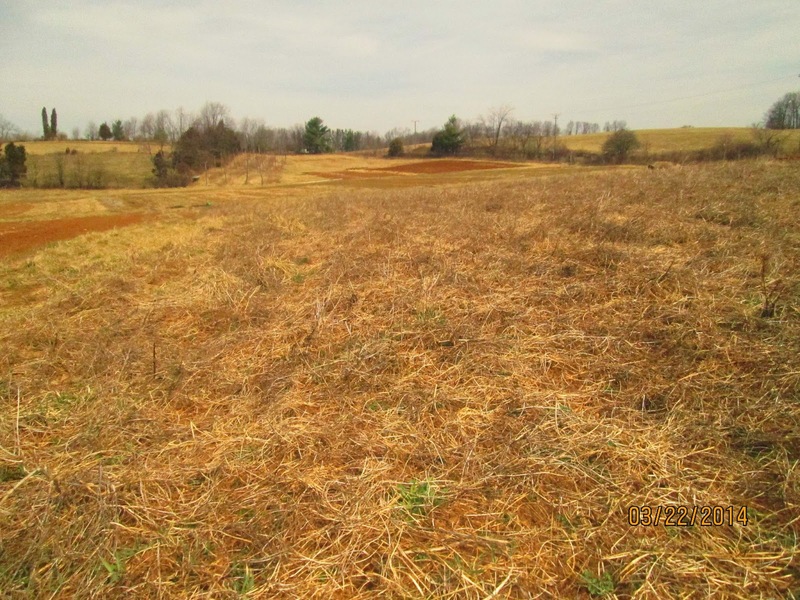 The importance of using cover crops in a farming system probably cannot be overstated. It's been practiced in some form since ancient times. One could say that it should be an integral part to any natural or biological farmers system. We are just really venturing into experimenting with different types of sowings and seeing what works. I've found the book "Managing Cover Crops for Profitability" online edition to be a helpful starting place. 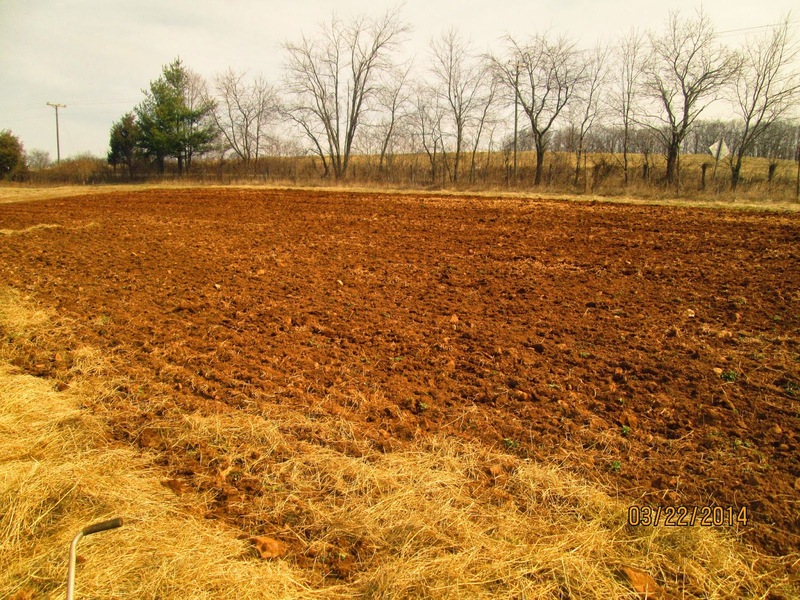 Sometimes you will see the term ''green manures" used in this context. 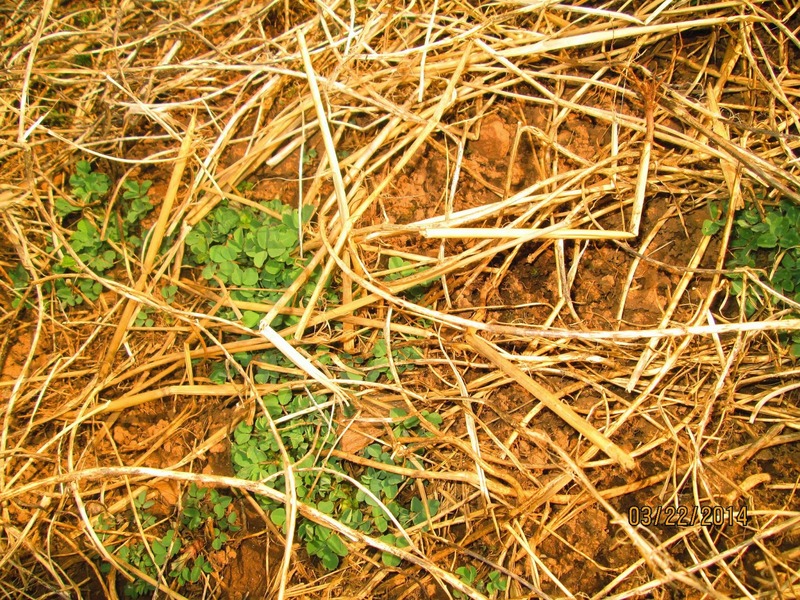 Here is some more information about using cover crops. Some drawbacks include taking land out of production for growing of a non cash crop, and for a small market gardener perhaps not having the tools on hand to deal with matters relating to all the green matter and how to turn it under or mow it down, etc.. Having a medium sized tractor (40-50 hp) one can do quite a lot. Or with horses. 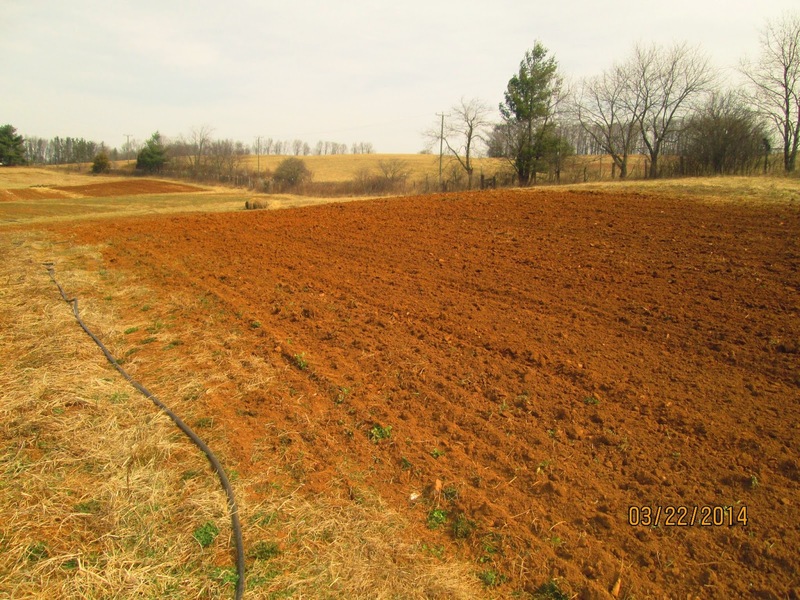 On 3/30/13 I seeded oats and sweet yellow clover on a section of our field not really anticipating on keeping that area "fallow" for the year. But, it ended up that way, seemed like a good experiment. The picture below is what it looks like today. Old oat and weed stubble, with little tufts of clover starting to grow again. 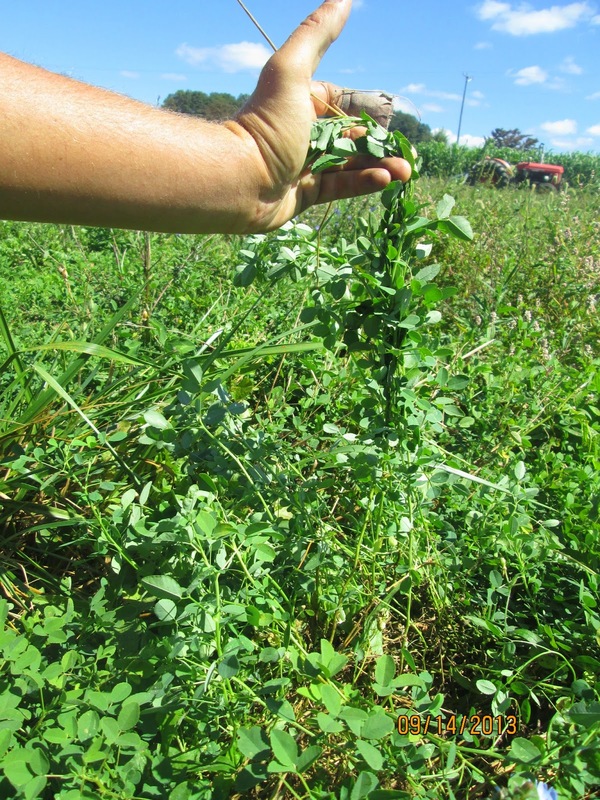 Sweet yellow clover is a biennial, and in our region oats are winter killed. So this year the clover will flower, I'll try to mow it while it's in bud stage, or right before flowering stage. 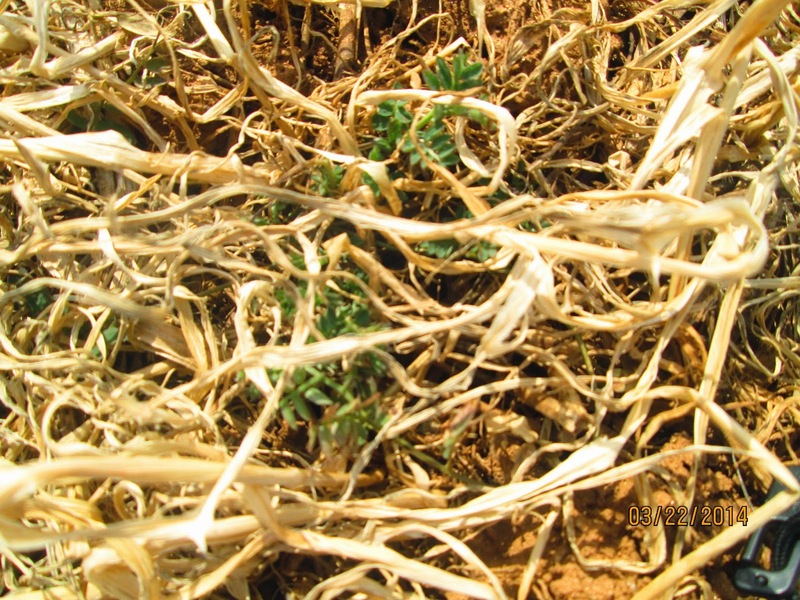 Below you can see what the sweet yellow clover looked like September of last year (2013). I had to mow this area two times. Once was to clip the oats down. The second time was toward the end of August to clip all the weeds. I just drove over with the bush hog set about 1.5 - 2 feet off the ground as to not disturb the clover too much. Above: First year growth of sweet yellow clover. Above: Here you can see the clover amidst last years oat stubble along with the stems from the previous years clover growth. Here we have oats, barley, crimson clover and vetch sown beginning of September 2013. This area had tomatoes that got late blight last year. I bush hogged the tomato plants down, disced twice, then broadcast the seed by hand and disced in. The oats and barley winter killed leaving a light residue on the surface. If I wanted to plant here sooner than later I could probably disc and it would be fine. I want to wait on some areas though to see how full the clover and vetch growth gets. For this years fallow/cover crop experiment I have the following. 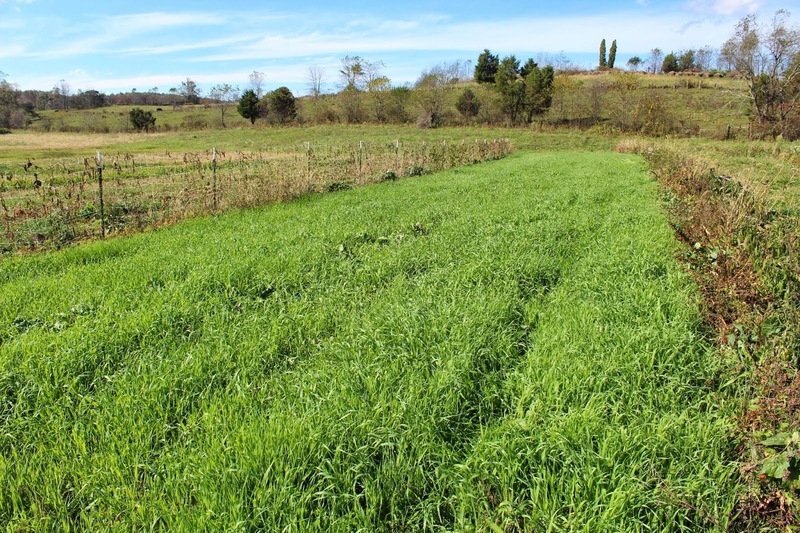 .42 acre that on March 21 was sown to Barley (rate: 40#/acre), Oats (25#/acre), S.Yellow Clover (5#/acre), Crimson Clover (5#/acre), White Clover (5#/acre), Winter Peas (12#/acre, inoculated). Here is the field, picture taken today. Last year this the bottom half of this field had Sorghum Sudan grass, the upper did not. I'm interested to see if this changes anything. Cost to seed this area was $61.77. 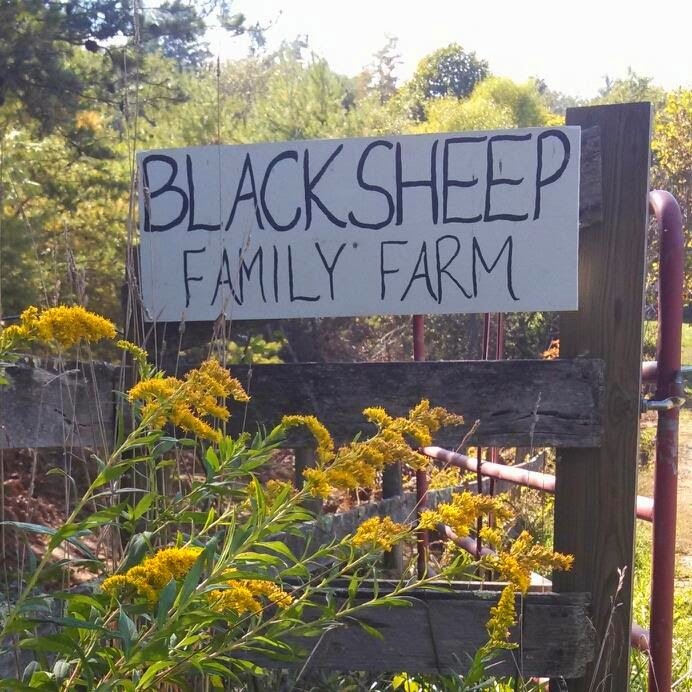 All cover crop seed purchased through Seven Springs Farm. Broadcast by hand, then lightly disc in. 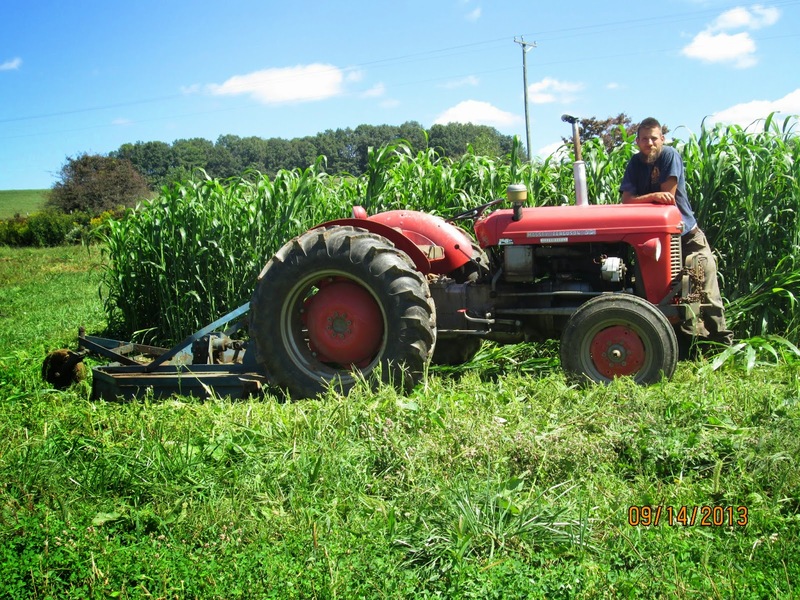 Sorghum/Sudan Grass being mowed last summer. Huge amount of bio mass. 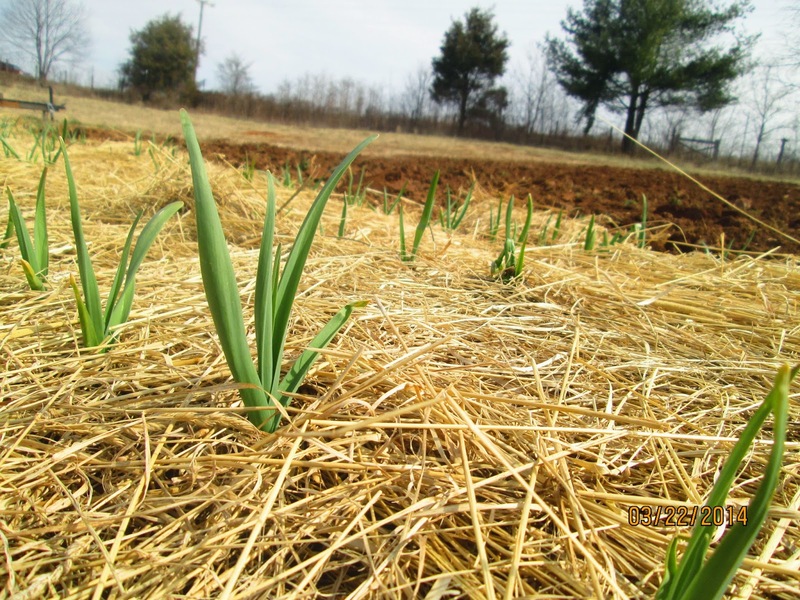 Garlic coming up nicely! 38.9#'s were planted November 11 last year. Mulched sometime in February. All our varieties are hard neck, most seed saved from the previous year. (Georgian Crystal, Georgian Fire, and a Floyd variety called Appalachian Red from Mark Schonbeck). 10 extra pounds was purchased of regional variety. Around here, first or second week of April seems like a good time to plant potatoes. This area was planted to oats, barley and clover last fall. The clover didn't really add any mass or any benefit at all in this particular instance since I've just had to disc it all in to prepare for potatoes. The winter killed oats and barley gave some protection. I thought there should of been more plant density though. I planted both of them at the rate of 45#/acre. Maybe this should be increased?